Aavin Recruitment 2019 has been announced for the below vacancies. Read the following Job Notification details to get a clear idea about Registration process, Eligibility, Qualification, How to apply, No of Vacancies, Salary, Job Location, Links to apply, Selection procedure, age limit and all the instructions before applying for this job. The Dairy Development Department was started in Tamil Nadu in 1958 to regulate milk distribution. It took over control of the milk cooperatives. It was replaced by the Tamil Nadu Cooperative Milk Producers Federation Limited in 1981. On February 1, 1981, the commercial activities were given over to Tamil Nadu Co-operative Milk Producers' Federation Limited under the trademark 'aavin'. Tamil Nadu is one of the leading states of milk production with 14.5 million litres per day. 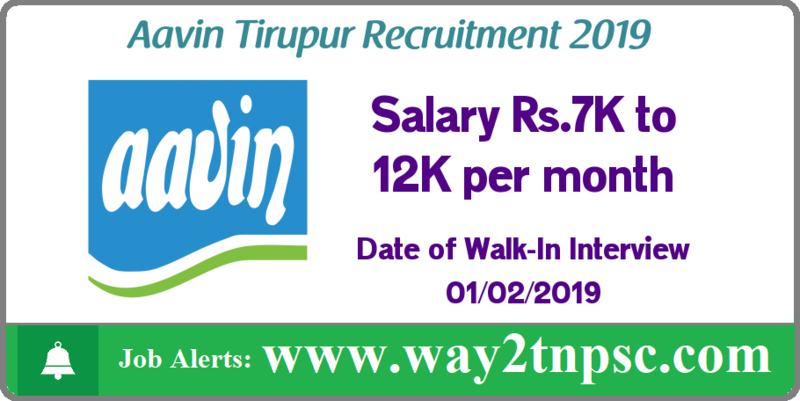 The above Notification ( Aavin Tirupur Recruitment 2019 - Marketing Executives | Apply online ) briefly describes about the details of latest announcement or notification includes important dates like release date , last date of application submission, details regarding fees, exam timings. Candidates, check all the needs and apply accordingly.